A writing instrument that costs $730,000? Unbelievable! Well, the luxury houses of Van Cleef & Arpels and Montblanc have rolled out an eye-cathcing writing instrument christened Mystery Masterpiece. Made of white gold, the pen is adorned with rubies, sapphires, or emeralds and accented by diamonds. 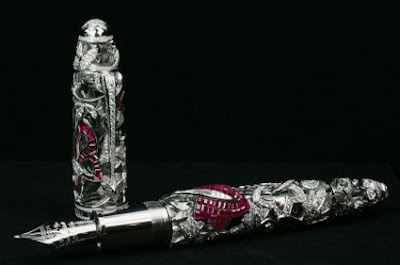 Nine pens will be sold worldwide, with each featuring 840 diamonds and more than 20 carats of gemstones set in a Van Cleef & Arpels patented ‘Mystery Setting’.